Italy has as many, if not more, bread recipes as it has regions. There are the integrale loaves made from wholewheat flour as well as more eye-catching creations such as Sardinia's wafer-thin carta da musica. But when the appetite for authentic Italian food began gripping consumers across the rest of Europe at the beginning of the 1990s, nothing epitomised it more than the appearance of ciabatta and focaccia on supermarket shelves. Ciabatta derives its name, which translates as slipper, from the shape, and while there are many good quality loaves manufactured commercially, it is relatively simple to produce at home. The process has two distinct stages: the starter, or biga, and the dough. Firstly take 170 grams of strong white bread flour or Italian doppio zero and combine in a bowl with about a quarter of a sachet of dried active yeast, a little extra virgin olive oil and 100 millilitres of tepid water. Work the mix into a soft dough and kneed for five minutes. Then oil the inside of the bowl, place the dough back in, rub it around the sides to coat it in the oil, and leave overnight in a warm part of the kitchen. The following day, mix 450 grams of flour, one and a half sachets of yeast, a generous drip of oil, 350 millilitres of tepid water and a couple of grinds of the salt mill in a bowl. When it begins to come together, add the biga and continue working until you have a slightly wet dough. Oil the bowl, place the dough back in and coat it in the oil, then leave it to rise for around three hours. Heat the oven to 220 degrees centigrade. Place the dough on a floured surface, knock it down and knead for about 10 minutes before placing on a baking tray or stone and shaping into the familiar slipper shape. Place it in the top of the oven and let it bake for 10 minutes, then turn the oven down to 190 degrees centigrade and move the tray down to the lower rack of the oven and bake for a further 40 minutes. What you are seeking to achieve is a hard crust and a loose chewy inner texture. The biga stage is not utilised for producing that other great favourite, focaccia. Simply combine 750 grams of flour, one packet of yeast, 500 millilitres of tepid water, salt to taste and a generous drip or two of oil. Knead thoroughly, then stretch it out on an oiled baking sheet, cover with a damp kitchen towel and leave to rise for around two hours. Remove the towel and work with your hands to push it back down and over the baking sheet, recover with the towel and let it rise for a further hour. Heat the over to 240 degrees centigrade, remove the towel and check the dough is covering all of the baking sheet, then make shallow indentations with your thumb and pour a generous amount of oil over the dough. At this stage, you could add some black olives, perhaps some sprigs of rosemary and sea salt, even some reconstituted sun-dried tomatoes. 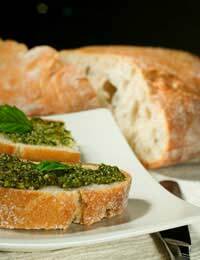 To give it a Ligurian flavour, add some pesto at the dough-making stage. Then bake for around 15 minutes until golden.